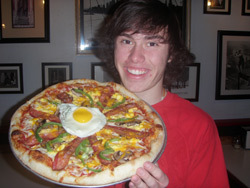 Big Apple Pizzeria has an amazing selection of Salt Lake pizza and Pasta. Big Apple Pizzeria even has a menu for the little ones including a slice of cheese pizza, two slices of cheese pizza, or even an all time favorite like spaghetti and meatballs. If you don’t like pizza Big Apple Pizzeria has so many options to choose from like our baked ziti, pesto spaghetti, or one of our Italian meatball sandwiches. Order your craving today and take it home or come in and enjoy your pizza with us. It’s time to get the family together so why not order pizza and pasta for dinner? If you want the best Salt Lake Pizza and Pasta than Big Apple Pizzeria is the place to go. Big Apple Pizzeria has something for everyone from cheese pizza to our employee specials that include some of our top of the like New York style pizzas. Why not get your family together and come enjoy a mellow evening in Millcreek and Big Apple Pizzeria, get them together and come in today. Come in to our convenient Millcreek location today and have the greatest Salt Lake pizza and pasta you have ever had. If your not a pizza lover try one of our great benders or calzones that are hot and made to order just the way you like. All of our ingredients are fresh and you can always expect the best service and quality at Big Apple Pizzeria. Come in today and see for yourself just what all the locals are talking about.